The Muppet Christmas Carol is a 1992 American musical fantasy comedy-drama film produced by Jim Henson Productions and distributed by Walt Disney Pictures. Adapted from Charles Dickens's 1843 novella A Christmas Carol, it is the fourth theatrical film to feature the Muppets, and the first to be produced following the death of Muppets creator Jim Henson in 1990. It’s also The Walt Disney Company’s second film adaptation of the Dickens story after Mickey's Christmas Carol in 1983. 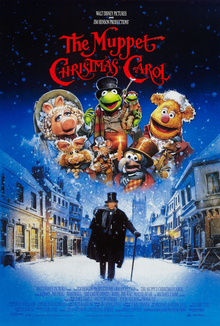 The film was directed by Brian Henson in his directorial debut from a screenplay by Jerry Juhl, and stars Michael Caine as Ebenezer Scrooge, alongside Muppet performers Dave Goelz, Steve Whitmire, Jerry Nelson, and Frank Oz portraying various roles, including Gonzo narrating the film as Dickens and Kermit the Frog as Bob Cratchit. Although artistic license is taken to suit the aesthetic of the Muppets, The Muppet Christmas Carol otherwise follows Dickens's original story closely. The Muppet Christmas Carol was released on December 11, 1992, to modest box office success and mostly positive reviews. As well as Jim Henson, the film is dedicated to fellow performer Richard Hunt, who died eleven months before the film's release. On Christmas Eve, in 19th Century London, Charles Dickens (played by Gonzo the Great) and his friend Rizzo act as narrators throughout the film. Ebenezer Scrooge (Michael Caine), a surly money-lender, does not share the merriment of Christmas. Scrooge rejects his nephew Fred's invitation to Christmas dinner, dismisses two gentlemen collecting money for charity, and tosses a wreath at a carol singing Bean Bunny. His loyal employee Bob Cratchit (played by Kermit the Frog) and the other bookkeepers request to have Christmas Day off since there will be no business for Scrooge on the day, to which he reluctantly agrees. Scrooge leaves for home while the bookkeepers celebrate Christmas. In his house, Scrooge encounters the ghosts of his late business partners Jacob and Robert Marley (played by Statler and Waldorf), who warn him to repent his wicked ways or he will be condemned in the afterlife like they were, informing him that three spirits will visit him during the night. At one o'clock, Scrooge is visited by the childlike Ghost of Christmas Past who takes him back in time to his childhood and early adult life, Dickens and Rizzo hitching a ride too. They visit his lonely school days, and then his time as an employee under Fozziwig (Mr. Fezziwig from the original story, played by Fozzie Bear), who owned a rubber chicken factory. Fozziwig and his mother throw a Christmas party, where Scrooge meets a young woman named Belle, with whom he falls in love. However, the Ghost shows Scrooge how Belle left him when he chose money over her. A tearful Scrooge dismisses the Ghost as he returns to the present. At two o'clock, Scrooge meets the gigantic, merry Ghost of Christmas Present who shows him the joys and wonder of Christmas Day. Scrooge and the Ghost visit Fred’s house where Scrooge is made fun of. Scrooge and the spirit then visit Bob Cratchit's house, learning his family is content with their small dinner, Scrooge taking pity on Bob's ill son Tiny Tim (played by Robin the Frog). The Ghost of Christmas Present abruptly ages, commenting that Tiny Tim will likely not survive until next Christmas. Scrooge and the Ghost go to a cemetery, where the latter fades away. The Ghost of Christmas Yet to Come then approaches Scrooge, appearing as a tall, silent cloaked figure. While Dickens and Rizzo abandon the audience to avoid being frightened, the Ghost takes Scrooge into the future. Scrooge and the Ghost witness a group of businessmen discussing the death of an unnamed colleague where they would only attend the funeral if lunch is provided. In a den, Scrooge recognizes his charwoman, his laundress, and the local undertaker trading several stolen possessions of the deceased to a fence named Old Joe. The Ghost transports Scrooge to Bob's house, discovering Tiny Tim has died. Scrooge is escorted back to the cemetery, where the Ghost points out his own grave, revealing Scrooge as the man who died. Realizing this, Scrooge decides to change his ways. Awakening in his bedroom on Christmas Day, Scrooge decides to surprise Bob's family with a turkey dinner, and ventures out with Bean, Dickens, Rizzo, and the charity workers to spread happiness and joy around London. Scrooge goes to the Cratchit house, at first putting on a stern demeanor, and then revealing he intends to raise Bob's salary and pay off his mortgage. Dickens narrates how Scrooge became a secondary father to Tiny Tim, who escaped death. Scrooge, the Cratchits, and the neighborhood celebrate Christmas. Steven Mackintosh as Fred, Ebenezer Scrooge's nephew. Meredith Braun as Belle, Scrooge's neglected fiancée. Robin Weaver as Clara, Ebenezer Scrooge's niece-in-law and Fred's wife. Following Jim Henson's death in May 1990, talent agent Bill Haber approached his son Brian with the idea of filming an adaptation. Haber told Henson that "Christmas Carol is the greatest story of all time, you should do that" and later informed Henson that he sold the idea to ABC as a television film. Longtime Muppets writer Jerry Juhl was hired to write the script and decided to insert Charles Dickens as the stand-in narrator in order to remain faithful to the original prose of the written material. Henson stated that Gonzo was chosen because he was the least likely choice to play Charles Dickens, while Rizzo the Rat was added to inject some humor and serve as a Greek chorus. Established Muppet characters were initially written to portray the ghosts, with various accounts stating Robin the Frog or Scooter was to be the Ghost of Christmas Past, Miss Piggy to be the Ghost of Christmas Present, and Gonzo (before he was written to portray Dickens) or Animal as the Ghost of Christmas Yet to Come. However, the idea was scrapped in favor of new Muppet characters that would better underline the ominous nature. After the script was submitted for approval to ABC, the executives of Walt Disney Pictures offered to purchase the script for a feature film instead of a television release. English actors David Hemmings, Ron Moody, and David Warner and comedian George Carlin were considered to portray Ebenezer Scrooge. Henson later offered the role to Michael Caine, who replied: "I'm going to play this movie like I'm working with the Royal Shakespeare Company. I will never wink, I will never do anything Muppety. I am going to play Scrooge as if it is an utterly dramatic role and there are no puppets around me." Production took place at the Shepperton Studios, England. During filming, in order to allow for the Muppets and the human actors to be in the shot, floors had to be removed and re-inserted, with Michael Caine having to walk across narrow planks between the Muppets and their performers. Additionally, the buildings in the London street scenes were constructed by hand but diminished in size in order to achieve the appearance that the streets were relatively longer. When the musical sequence "It Feels Like Christmas" ends with the crane shot, the short buildings became visibly seen in the background, in which Brian Henson explained on the DVD audio commentary that they were aware of the problem during shooting, but eventually decided that the closing shot was worth it as they believed not many people would notice the error. Disney appeared to have high expectations for the film, being their widest-released film of the holiday season and the second-widest release under the Walt Disney Pictures banner that year. However, the film opened in sixth place, initially reported to have collected $5.9 million in box office estimates, which was later revised to have grossed $5 million. Ultimately, The Muppet Christmas Carol grossed a total of $27.3 million in North America. Despite being a modest box office success, The Muppet Christmas Carol did not have a large effect during its theatrical release, having to face competition from Home Alone 2: Lost in New York and Disney's own Aladdin. The film received mostly favorable reviews from critics. Janet Maslin, reviewing for The New York Times, summarized the film as not a "great show of wit or tunefulness here, and the ingenious cross-generational touches are fairly rare. But there is a lively kiddie version of the Dickens tale, one that very young viewers ought to understand." Chicago Sun-Times film critic Roger Ebert, who gave the film three stars out of four, praised the technical achievements, but felt it "could have done with a few more songs than it has, and the merrymaking at the end might have been carried on a little longer, just to offset the gloom of most of Scrooge's tour through his lifetime spent spreading misery." On the television program Siskel & Ebert, his partner Chicago Tribune film critic Gene Siskel gave the film a Thumbs Down although he was favorable towards Michael Caine's performance. Also from The Chicago Tribune, Dave Kehr reviewed the film as "a talky, plodding film that seems likely to bore children and adults in equal measure." Nevertheless, Kehr praised Val Strazovec's production design and John Fenner's cinematography believing its "shadowy, naturalistic lighting creates a new look for a puppet film", but derided Paul Williams's songs as unmemorable. Likewise, Variety praised the production design and criticized Williams's songs, writing Muppets Christmas Carol is "not as enchanting or amusing as the previous entries in the Muppet series. But nothing can really diminish the late Jim Henson's irresistibly appealing characters.” Giving the film three stars out of five, Almar Haflidason of the BBC wrote the film is "liberal but fun adaptation of a classic" that "turns out to be quite touching as Muppet movies go. Less pleasing are the forgettable songs that offer both clumsy word construction and dire music that eats away at the aesthetic quality of the movie. But you'll be too busy looking out for the assorted Muppets to care much." Anthony McGlynn of Screen Rant called The Muppet Christmas Carol "a work of genius on every level" and "the greatest Christmas movie ever made", praising the original songs that were written for the film and Michael Caine's performance as Scrooge. On the review aggregator website Rotten Tomatoes, Muppet Christmas Carol has a 74% approval rating, based on 43 reviews, with a rating average of 6.5 out of 10. The critical consensus states "It may not be the finest version of Charles Dickens' tale to grace the screen, but The Muppet Christmas Carol is funny and heartwarming and serves as a good introduction to the story for young viewers." This is the first Muppet film co-produced and released by Walt Disney Pictures—and the rights to the Muppets featured in the film would later be purchased by the studio's parent company. In addition to theatrical releases, the film has also been made available on home video formats. It was released on VHS in the US on November 5, 1993, in the UK on November 19 and twice on DVD in Region 1. The first DVD release on October 8, 2002, was in a full-screen-only format. Walt Disney Home Entertainment re-released the film on DVD on November 29, 2005, in conjunction with Kermit the Frog's 50th anniversary celebration; this time the DVD contained both full-screen and widescreen presentations. The film was also released in Region 2. Walt Disney Studios Home Entertainment released a 20th anniversary collector's edition on Blu-ray, DVD, and digital copy on November 6, 2012. The release doesn't include the film's extended cut. However, the song "When Love Is Gone" and its accompanying scene can be viewed in its entirety on the full-screen version of the anniversary edition of The Muppet Christmas Carol, though it is cut in the widescreen format. The film's original score was composed by Miles Goodman with songs written by Paul Williams. Williams previously worked with the Muppets on the soundtrack to The Muppet Movie (1979) in which he and Kenneth Ascher were nominated for an Academy Award for writing "Rainbow Connection". Goodman previously scored several films that were directed by Muppet performer Frank Oz. The Muppet Christmas Carol: Original Motion Picture Soundtrack contains all of the songs from the film, which were written by Paul Williams, as well several cues from the score by Miles Goodman. The performances are by the Muppet characters as well as Caine, and the album also includes the songs "Room in Your Heart" and "Chairman of the Board" that were recorded but never filmed. As with all Muppet films (except Muppets from Space (1999)), The Muppet Christmas Carol was shot as a musical. The soundtrack album peaked at number 189 on the Billboard 200 chart. The soundtrack was digitally re-released by Walt Disney Records on November 6, 2012. "When Love Is Gone" was a song performed by the character Belle (portrayed by Meredith Braun) as she laments that Scrooge's love of money has replaced his love of her. The song itself was deleted from the original 1992 theatrical edition by Jeffrey Katzenberg of Walt Disney Studios, who believed that the following scene would not appeal to young children. Instead, the song appeared in (and was played during) the end credits scene. Director Brian Henson objected to this decision. The concluding song, "The Love We Found", is a direct counterpoint to it. Henson commented: "'When Love Is Gone' was not in the theatrical release, and is presently missing from some copies of the movie, which is a real shame." The song titled "When Love Is Gone" is only included on some home media releases of The Muppet Christmas Carol which are now out of print. The song is included on all of the 1993 VHS and LaserDisc releases. The LaserDisc version includes the only widescreen presentation of this song ever released. The 2002 and 2005 DVD releases do retain the song, but only in the full-screen version of the film. A 2012 standalone DVD release of the film uses the same disc from the 2005 release, so it also contains the song. However, a different DVD was used for the 2012 Blu-ray combo pack which does not contain the song. The digital download release of the film contains the entire "When Love Is Gone" as a bonus feature, in widescreen and in high definition. ^ "The Muppet Christmas Carol (U)". British Board of Film Classification. December 2, 1992. Retrieved July 27, 2015. ^ "The Muppet Christmas Carol (1992)". Bfi.org.uk. Retrieved October 30, 2017. ^ a b "The Muppet Christmas Carol (1992)". Box Office Mojo. Retrieved February 16, 2013. ^ Rainer, Peter (December 11, 1992). "The Muppets Take On Dickens' 'Carol'". Los Angeles Times. Retrieved August 7, 2018. ^ a b c Brian Henson, Steve Whitmire (December 21, 2015). "How we made: The Muppet Christmas Carol". The Guardian (Interview). Interviewed by Ben Beaumont-Thomas. Retrieved December 25, 2015. ^ Brian Henson (December 18, 2015). "The 'Rainbow Connection' Connection And Other 'Muppet Christmas Carol' Facts". Uproxx (Interview). Interviewed by Alyssa Fikse. Retrieved December 25, 2015. ^ a b c Brian Henson (December 23, 2015). "Brian Henson On What Makes 'A Muppet Christmas Carol' So Special And His Father's Legacy". Uproxx (Interview). Interviewed by Alyssa Fikse. Retrieved December 25, 2015. ^ Heaney, Katie (December 12, 2013). "14 Things You Didn't Know About "The Muppet Christmas Carol"". BuzzFeed. Retrieved December 25, 2015. ^ Heckman, Don (December 13, 1992). "Ghosts of Music Past: 'The Muppet Christmas Carol' songwriter Paul Williams undergoes a metamorphosis no less powerful than Scrooge's". Los Angeles Times. Retrieved December 18, 2010. ^ Fox, David J. (December 15, 1992). "Weekend Box Office : 'Home Alone' Passes $100 Million". Los Angeles Times. Retrieved July 6, 2012. ^ Fox, David J. (December 14, 1992). "'Good Men' Salutes Its $16 Million". Los Angeles Times. Retrieved December 27, 2015. ^ "Weekend Box Office Results for December 11-13, 2015". Box Office Mojo. Retrieved December 27, 2015. ^ "The Muppet Christmas Carol". Rotten Tomatoes. Retrieved December 11, 2016. ^ Maslin, Janet (December 11, 1992). "The Muppet Christmas Carol – Review/Film; Kermit, Etc. Do Dickens Up Green". The New York Times. Retrieved July 6, 2012. ^ Ebert, Roger (December 11, 1992). "The Muppet Christmas Carol Movie Review (1992)". rogerebert.com. Retrieved July 6, 2012. ^ "A Few Good Men / The Muppets Christmas Carol / Passion Fish (1992)". Siskel & Ebert. Retrieved December 27, 2015. ^ Kehr, Dave (December 11, 1992). "`Muppet Christmas Carol` Is Short On Holiday Spirit". Chicago Tribune. Retrieved December 27, 2015. ^ Variety Staff (December 31, 1991). "Review: 'The Muppet Christmas Carol'". Variety. Retrieved July 6, 2012. ^ Haflidason, Almar (December 14, 2000). "Films – review – The Muppet Christmas Carol". BBC. Retrieved July 6, 2012. ^ McGlynn, Anthony (December 23, 2018). "Best Christmas Movies Of All-Time". Screen Rant. Retrieved December 23, 2018. ^ "The Muppet Christmas Carol (1992)". Rotten Tomatoes. Flixster. Retrieved December 6, 2017. ^ "'The Muppet Christmas Carol: 20th Anniversary Edition' Dated for Blu-ray". High-Def Digest. Retrieved July 30, 2012. ^ Brown, Kenneth (November 6, 2012). "The Muppet Christmas Carol Blu-ray Review". Blu-ray.com. Retrieved November 6, 2012. ^ Plume, Kenneth (February 10, 2000). "INTERVIEW WITH FRANK OZ". IGN. Retrieved March 12, 2015. ^ "The Muppet Christmas Carol [Original Soundtrack] - The Muppets - Songs, Reviews, Credits". AllMusic. Retrieved October 30, 2017. ^ Grace, Willie (December 12, 2014). "Why The Muppet Christmas Carol's song Was cut, But Really Should Have Stayed". Houston Style Magazine. Retrieved December 25, 2015. ^ "Brian Henson On What Makes "A Muppet Christmas Carol" So Special And His Father's Legacy". UPROXX.